Step back to the original Mickey and Minnie cartoons with this gorgeous sterling silver charm. 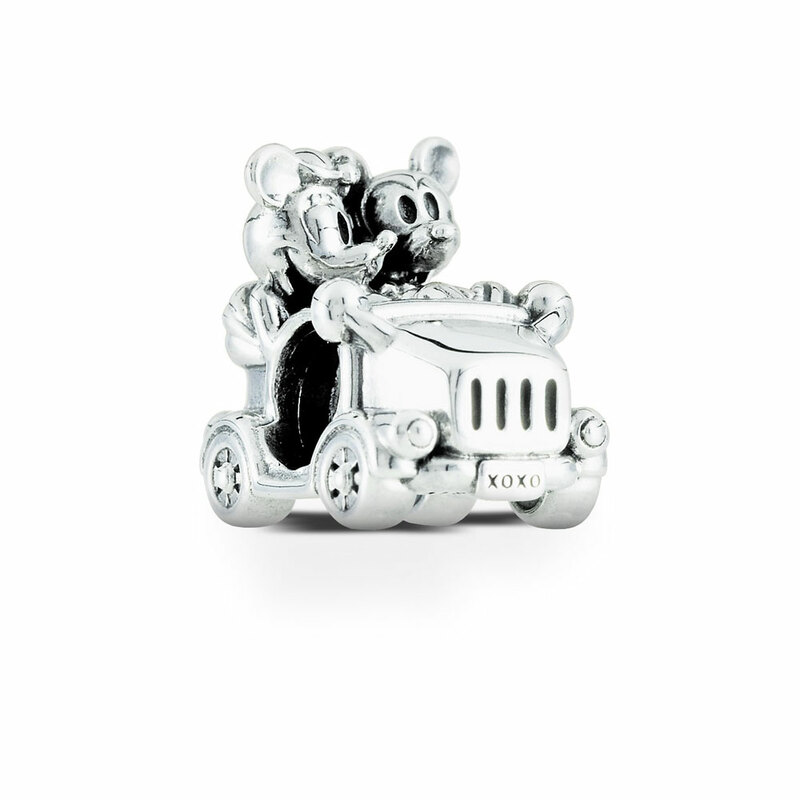 It depicts the iconic scene of Mickey and Minnie at the wheel of a vintage car while they drive around town. It’s the perfect charm for every Mickey and Minnie fan. Available online or in-store. Disney Mickey and Minnie Vintage Car Charm is rated 5.0 out of 5 by 34. Rated 5 out of 5 by Chong from Detailed cute charm! I was worry this charm maybe too big but it actually in a very good size. I put it on my flourishing heart bangle, it reminds me the time i spent with my husband in our car. Minnie is holding mickey’s arm when he is driving! So cute! Rated 5 out of 5 by Mercedez95 from Perfect Mickey & Minnie Couple Charm The amount of detail that Pandora put on this charm is very cute and the license plate even says "XOXO". It's not too bulky and fits nicely between my other Disney charms. Out of all the Mickey & Minnie couple charms to choose from I would recommend this one. Rated 5 out of 5 by ctru3ba from LOVE this charm Bought this last week in Disney’s Magic Kingdom and I am so happy I did. I drive a Jeep and to me it looks like a vintage Jeep and being a Disney lover, i had to have it! An adorable charm! The details are so appealing! Definitely an eye- catching charm. Rated 5 out of 5 by Disneyfan66 from Great details and doesn’t flip over. I bought this charm and it very cute. It has great detail and doesn’t flip over so the car is always showing. Rated 5 out of 5 by hrsdisneyfan2 from So sweet! I just received this charm along with my Mickey clips. I know I say this in all my reviews (I was hrsdisneyfan had to change my name not sure why maybe it was because of the site update) but I cannot get over the details in something so small! They are absolutely adorable in the car together. I was afraid it would stick out beyond the other charms width/depth wise, it does not. It is ever so slightly taller than my Disney Muranos. This is a must have! Rated 5 out of 5 by Cvillalta from So much details!! ❤️ I bought this for my Mickey Mouse bangle and I love it so much! So much joy and all in this little charm! Rated 5 out of 5 by Ginnymae25 from So cute! This Mickey/Minnie charm is beyond cute! Very well made and excellent attention to detail. This is one that any Disney lover would absolutely love to have! Rated 5 out of 5 by Gg625 from High quality/Vintage look I adore both Mickey and Minnie and vintage cars so I knew I had to get this charm the moment I saw it. It took no time at all to receive in the mail. The first thing I noticed was how detailed this charm was. It’s absolutely perfect! When I picked up the charm I realized it has some real weight to it, very sturdy for something so tiny. I’m so happy with this purchase and the over-all quality of the product. If you’re into old school Disney, you’ll love this charm!